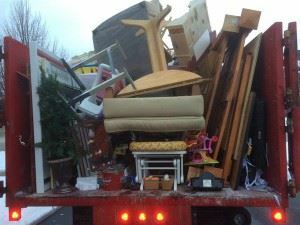 There is a long list of items that municipal garbage haulers won’t pick up. That leaves many homeowners and apartment managers stranded when it comes to getting rid of large amounts of rubbish. You won’t run into a problem with Junk King Indianapolis. As far as they are concerned anything and everything can go! Junk King likes to move fast. That doesn’t mean they will treat your property with respect. It just means that they know how to get in and get out quickly with all kinds of heavy and bulky objects. If it works better for something to be taken apart, then that is just what junk King will do. Recommendations from satisfied customers make up the bulk of Junk King Indianapolis clientele. Are you ready to add your name to that list? Hire them today. This entry was posted in Indianapolis Junk Removal and tagged clutter, Junk King, junk removal, reviews on September 30, 2017 by Junk King. Last updated October 1, 2017 .